Sunday, the third day of Sprint event in Sydney was less busy than Saturday but still interesting and dynamic with one qualifying session and third race of the weekend. As you may know, in the Super Sprint events in V8 Supercars championship, two races are short ones (10-15 laps) and third one is the big one with 50+ laps which lasts over an hour. This was the case in Sydney and after two short ones which were won by Chaz Mostert and Jamie Whincup, the third race was held on Sunday. The qualifying session started at 11:45 local time and fastest time was achieved by Scott McLaughlin with time of 1:30.1669 minutes. This was not the fastest time we saw this weekend but it was good enough to earn him the pole position for the afternoon’s race. Second was David Reynolds and third was rising star and Ford’s best driver this season, Chaz Mostert. However, after an hour and half of racing, blue Ford Falcon of Chaz Mostert saw checkered flag first in an interesting and dynamic race. In second was Fabian Coulthard in a Holden and third was Jason Bright in his best finish of the season. With this result and with good driving most of the season, Mostert put himself on second position in championship standings behind his teammate Mark Winterbottom and with realistic chances of winning the championship if he can be on podium for the rest of the season. 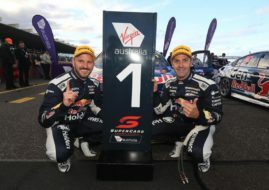 After yesterday’s win by Jamie Whincup it looked like last year’s champion and the best driver in history of V8 Supercars championship is back, but his performance in the third race was not up to his standards. For full results, click HERE.